Start your honeymoon vacation on a relaxing note by indulging in a pampering massage treatment. The aromas of the essential oils, coupled with the soothing kneads of the massage therapist and the usage of luxurious spa products are sure to send you into a state of utter bliss. A myriad massage parlours, ranging from casual beachside spots to luxurious hotel or resort spa parlours ensures that you can enjoy a spa treatment at any time of the day. However, when it comes to a once-in-a-lifetime honeymoon, only the very best will do, so treat yourself to a therapeutic couples’ massage session at one of the best day spas on the island. 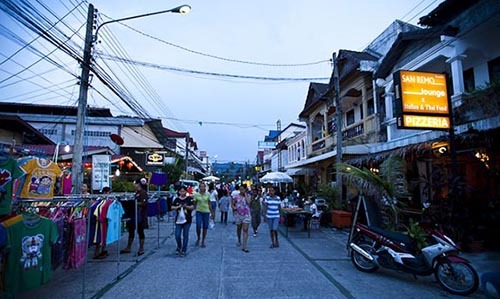 Immerse yourselves in the fascinating sights and sounds of the bustling walking streets of Samui. After a romantic dinner, walk off the calories by navigating your way through the throngs of enthusiastic crowds and rows of stalls. You will chance upon vendors selling an eclectic collection of wares, ranging from clothes and accessories, to local products and souvenirs. Couples with an adventurous palate and avid love of food will feel as if they have just stepped into a foodie paradise, for a wide array of local snacks and sweets are available at the street food stalls. The couple who works out together, stays together! If you and your other half possess a shared interest for zen-like activities, a couples’ yoga session is sure to float your boat. Sign up for a private lesson with an instructor to ensure that you get personalised attention and specific instructions. If you have more time on your hands, embark on a cleansing and revitalising experience together by joining a holistic detox treatment at Samahita Retreat. 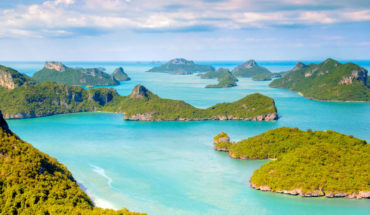 On a beautiful evening, set sail into the boundless seas of Samui on a quaint boutique yacht. 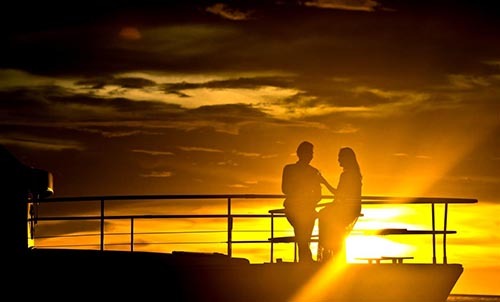 Wait in anticipation for the magical hour of sunset, for it brings a spectacular sight. Watch on, as the sky turns into a colourful palette made up of blue, purple, pink and amber hues. 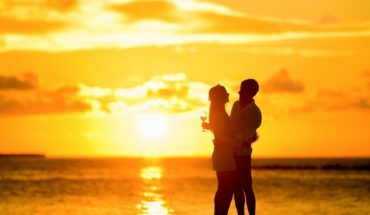 A romantic sunset cruise can be customised to suit your preferences – a half-day charter will be suitable for couples tight on time, while a full-day or overnight charter will suit honeymooners planning an unforgettable retreat. Try your hand at cooking up a Thai feast with that special someone! Perfect for couples sharing a love for food and culinary pursuits, such classes may involve a trip to a local farm or market, followed by a cooking session with the instructor. Round off the session with a feast on the culinary delights of the day. 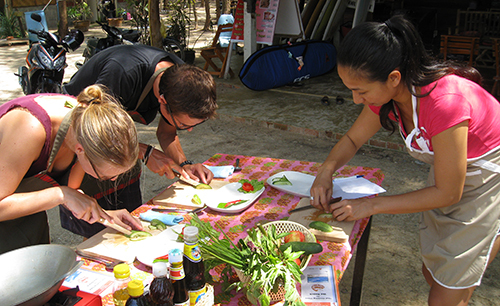 Health-conscious individuals with a preference for wholesome and organic food will be pleased with the Thai cooking classes at Island Organics. You will start off with a visit to Lat’s organic farm to pick a choice selection of fresh ingredients, before starting on a fun-filled cooking class. Couples keen on a homely cooking session will enjoy classes conducted by the affable Sonja, while those in search of an exquisite setting and top-notch culinary equipment may sign up for culinary classes offered at Samui Zazen. 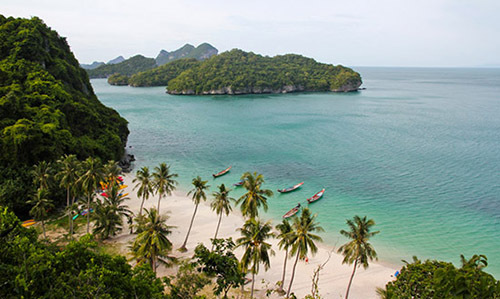 A day excursion to Angthong Marine National Park is a feast for the senses. Look out into the yonder, and let your gaze rest on the picturesque coastlines of the forty-two islands making up the archipelago. As you cruise along on a speedboat, feel the sea breeze rustle up your hair, and let the bright tropical rays leave a sunkissed glow on your skin. Offering a plethora of activities, there is something for everyone on the island. Couples with a love for underwater expeditions will enjoy embarking on scuba diving and snorkeling trips. Those who prefer staying dry on land may cruise atop the waters on a kayak, or lounge languorously on the sandy shores. Travellers with an appetite for adventure will enjoy getting a thrill of adrenaline rush from venturing on a challenging hiking trip. 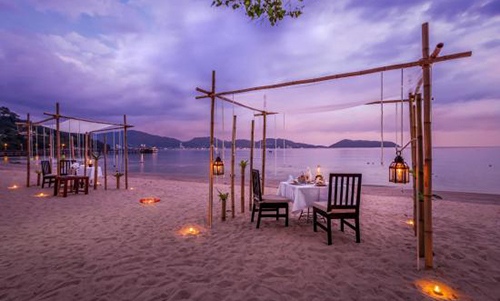 Nothing spells romance like an intimate dinner along a private beach. Under the starry night sky, tuck into a scrumptious spread in a stunning outdoor setting decorated with pretty candles, silky drapes and vibrant flowers. Impeccable service by a personal butler ensures that you and your partner will not have to lift a single finger throughout the decadent dinner. You will find a good number of luxury hotels and resorts offering such dining experiences. Honeymooners residing in a private beachfront villa may engage the help of their villa manager to plan a similar experience.